The Garmin StreetPilot 2820 satellite navigation system is preloaded with European street maps and built-in Bluetooth wireless capability. Garmin's full-featured GPS navigator for your car or motorcycle also features hands-free calling, real-time traffic capabilities, MP3 player, audio book player, and an extensive points-of-interest database. Garmin StreetPilot 2820 has been discontinued. Accessories, spares and parts are still available for your StreetPilot 2820. The Garmin StreetPilot 2820 in-car satellite navigation system integrates wireless technology with a microphone and speaker that lets you make hands-free calls on a compatible Bluetooth phone. Motorcyclists can connect a Bluetooth-enabled headset or helmet simultaneously with a Bluetooth phone to the Garmin StreetPilot 2820 to talk hands-free on the road or receive wireless navigation audio prompts to their destination. The Garmin StreetPilot 2820 satellite navigation system is preloaded with maps of Europe, includes turn-by-turn voice directions speak street names, fingertip touch screen interface, remote control and 2D or 3D map perspective and also with the ability to arrange destinations to minimize trip distance. The Garmin 2820 satnav system also accepts customized points of interest (POIs) such as school zones, speed cameras, and LPG filling stations and includes proximity alerts to warn of upcoming POIs. Monitor traffic tie-ups with the addition of an optional traffic receiver. In select metro areas, with the addition of the GTM 12 FM TMC traffic sensors, the Garmin SteetPilot 2820 notifies you of accidents, road construction, and weather-related traffic delays before they are encountered, and then offers an alternate route. The Garmin StreetPilot 2820's MP3 player and audio book player keep you entertained on the road. The MP3 player allows you to browse music by artist, album, and/or song. Optional audio books may be purchased from audible.com which features over 70,000 hours of audio programs. The Garmin StrretPilot 2820 is powered using the external speaker with a 12-volt adapter cable or A/C power adapter (both included in purchase). The Garmin StreetPilot 2820 also offers WAAS-enabled support to ensure the highest degree of GPS accuracy. The Garmin StreetPilot 2820 includes a pre-programmed 2.5Gb hard drive that stores City Navigator detailed maps of the UK and Europe. Motorists can navigate to a specific address or access an industry-leading database of more than five million points of interes - including lodging, restaurants, gas stations, and local attractions. The intuitive, menu-driven touchscreen ensures that navigating the unit is as easy as navigating the road. Looking for accessories and spares for the Garmin StreetPilot 2820 view them all here. 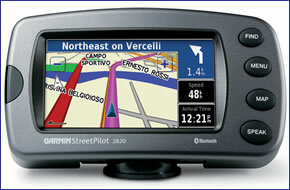 All parts are genuine Garmin product and specifically designed for use with the StreetPilot 2820 sat nav.